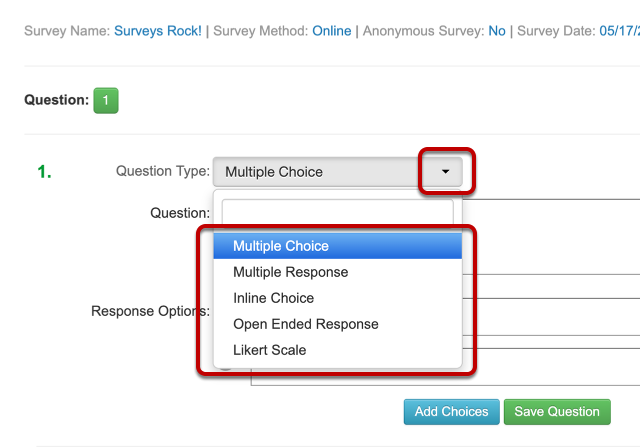 In this lesson, you will review the various Question Types available when building a survey. Enter the question in the Question box. In Response Options, enter at least 2 options or answers available. To add additional responses or answers, select Add Choices. To save and complete this question, select Save Question. Multiple Choice can only have 1 response or answer selected. In Response Options, enter options. To add additional choices select Add Choices. Multiple Responses can have more than 1 selected response. Enter the question in the Question box. Typically it is a sentence with a blank or space. In Response Options, enter options they can choose from to complete the sentence. Enter the question or Prompt in the Question box. Those who are taking the survey will input or type a response. To save and add this question, select Save Question. Likert Scale usually has a specific format such as a 5 or 7 point scale to measure Agreement, Frequency, Importance, or Likelihood. Ready for get started? Visit Create a Survey to start building a survey!